Well, finally I was a bride to my groom and I thought I was now a free soul to make my rules (and bend them) and that gone are the days of elders shouting or fuming at me. I was thoroughly pampered as a wife by my hubby, but alas it only lasted till our baby was born. After that I was no longer eligible for the bear hugs when I was upset, no ‘Sorry cards’ to pep up my mood after fights, no cuddling when nightmares hounded me, no silly sweet nothings murmured, no more walks hand in hand, no favourite foods of mine cooked for me (except by my mom who send in occasionally, my very favorite foods), no consoling when I was shattered with the mad things happening around.Now this wasn’t because people around me didn’t love me anymore…its just that now everybody expect a Mom of 7 year old to be a responsible, strong, mature lady, capable of handling EVERYTHING around her (Duh….). Yeah..I was finally a strong soul that I longed for….but as I said earlier, human beings are nasty….so now all that I crave for are simple gestures that brighten up a kiddie mind inside me. Those teeny weeny candies given to me as a bribe to behave NICELY in front of relatives, those little dolls gifted, when I fair-ed well in exams, the ridiculously decorated birthday cards by friends, those not-so-costly but adored like gold, gifts by neighbors and friends, the GOOD or VERY GOOD remarks given by teachers in the notebooks when I wrote properly, those sweet hugs by parents when we did well in school, dear mother making my favorite dishes on my birthdays, and friends and neighbors surrounding me on that day, just to get some extra attention and maybe an extra chocolate (well honestly me too did same on their birthdays…lolz)……I miss those sweet pamperings so much. Well as they say, nothing remains same forever, so now its our kid’s turn to be pampered as we were, by our parents. Not that I am complaining, but sometimes the kid inside you budge its head and you feel like grabbing some more attention, some more applauds, some more bribes (not monetary of course) from the people around you. So while I ranted about all this, I simultaneously pampered my self, in absence of anyone else to do the honours. And what better for a foodie blogger than to cook something for herself ?? To begin with, one of our neighbour…. Aunty K,who was a very enthusiastic lady, never tired of daily chores, a wonderful cook and a jolly fellow, always made some simple but drool worthy food and would make a point to send a share to our home (my maternal family). My mother actually learnt sabudana khichdi, potato toasters, Idly sambhar etc from that graceful lady. Alas, Aunty K, is no more with us. But she still stirs some great memories and specially reminds me of a Sindhi kadhi (no not the usual one) which used to be the most tasty kadhi I ever had at her place. So today I share with you, yet another authentic Sindhi Kadhi, and the recipe is of Aunty K’s father -in-law, respectfully called as Baba. Hai Alka, was looking at your recipe of Aur Ji Baaji and it brought back memories of my mother cooking for us and as kids we relished it with delight. The recipe that I learnt from my mother is a little different. She used to add ginger and garlic (pounded), diced onion and put it to boil without sautering it. She used potatoes, maayoo instead of radish and sometimes varyun. Once these were almost cooked then add kookum, and besan paste with turmeric,salt, red chilli powder and add this to the curry ,also she used to add chopped green chillies. Simmer for awhile. Heat a little oil and temper mustard seeds and add to the pot of gravy, cover and put out the heat. 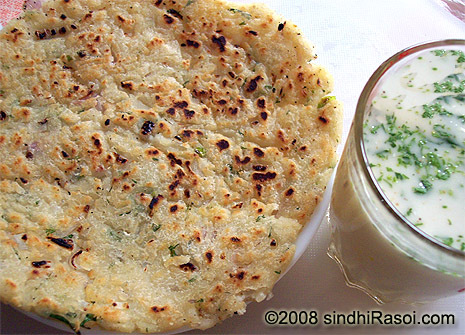 Nice recepies Alka,Sindhi food is always delicious, kindly share maalpua recepie. i honestly loved the way you went about describing the curry. sounded wonderful.. havent tried it yet but will love to with ur enthusiasm. your recipes are excellent and you really brought the sindhi cooking to other households. thanks. That looks great!! Love the color…. Thanks for posting!! Hi Alka, Enjoyed reading. I also love to be pampered, but after marriage they really treat us matured and lots of responsoiblities. Nice curry, we use raddish sambhar only, sounds freat. Lovley colour. i can eat any sindhi kadhi bowl after bowl. truly, i prefer it to gujju or punjabi kadhi. i will try this soon. This is really new for me, looks very tempting.. I can totally related some of the missing… with you and i do have 7 years old kid who stole all my pampering part! 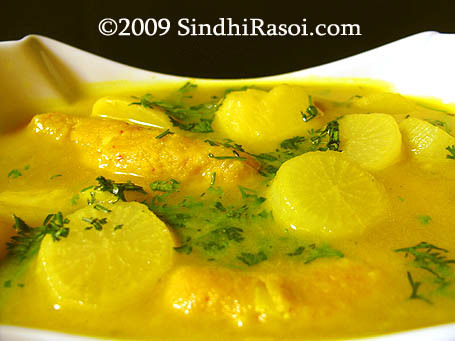 I made yest radish sambar, Sindhi food re totally different, Love the color of ur dish! Hmmmmmmmmmmmm. Collecting words to write down here…. Many a times i too feel so…….. Coming to the recipe. Looks tempting, alluring and yum. Simply yum……. Due heavy power cuts i could not see the roundups… Just now got throught the yummy entries. Hats off to you for coming with the idea of event and organising everything……Gr8. Awesome and glorious roundup…..
Love the color of that dish, Alka. 🙂 So cheerful. I shall try this soon. i was penning down same thoughts for next post and glad to see there is someone who thinks exactly like me! beautiful write-up alka and i really enjoyed reading it. That’s a great picture, Alka! Esp the radish slices, they look so good. Actually inspires me to try and make the besan rolls, not something I venture to do normally. you speaked our minds, really perfect writeup.. n Really nice kadhi too.. Thanx for sharing..
Wow… what a beautiful looking dish Alka! It makes my stomach tumble! Lovely read! So identify myself with the “pampering” thought! Recipe was equally great – have never had it. Nice learning about Chappru’s too! Very nice writing, stirred some memories and thoughts of my own. The color of the kadi looks awesome. Feel like having with with warm rice. I guess all of us share the same feeling!.. :).lovely dish…thanks for sharing your memories! Nicely written post, am sure most of us go thru the same. Love the color of the curry and radish must be goin so well in it. There is an onslaught of non Sindhi dishes on TV food shows using different spices, Sindhi cuisine is simply the best. 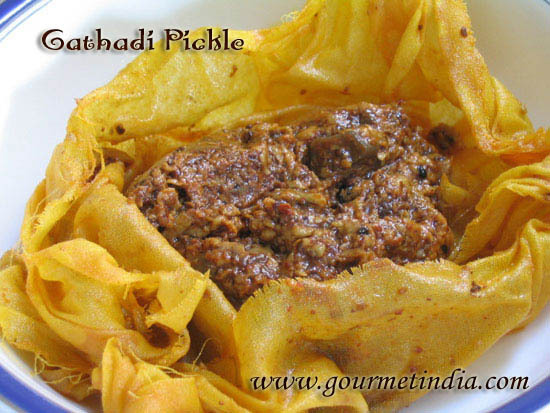 We make Radish with potato sambar, Love the combination..This looks very authentic and yummy.. Adding gram flour is new and delish..
Nicely written. Don’t worry, it is exactly how I feel too.Now you crave more for pampering..I wonder sometimes, Is it only me..Good to know that I have company. Bullseye, Alka!! I could do with some pampering too – only they know they have pampered me too much these last few days so if I complain I will get all the reprimands a little kid does!! I know the pain chubby cheeks cause having been at the receiving end too but at least I don’t pull my neighbour’s kid’s cheeks – they are chubby and rosy. Maybe the kid will love me for that when she grows:) I like the unusual combo! I have only made sambar with mooli but this sounds delish! Thanks alot for a wonderful recipe,I’ve had this in Mumbai at a Sindhi friends place and cud never look for a recipe as i had forgotten the name.Superb..looks wonderful Alka.Coming to your writeup,i can totally relate to you for the first bit.I have chubby cheeks right from the time i was a kid,my neighbours would always pinch my cheeks and i wud get irritated,it is so painful:-(.Now i wish i was a kid and get all the attention.Not that i dont now,am very well pampered by my husband,my parents,my inlaws but still the best attention i’ve got is only as a kid……i wish there was a rewind button in life..wat say???? Thanks alot for a wonderful recipe,I’ve had this in Mumbai at a Sindhi friends place and cud never look for a recipe as i had forgotten the name.Superb..looks wonderful Alka.Coming to your writeup,i can totally relate to you for the first bit.I have chubby cheeks right from the time i was a kid,my neighbours would always pinch my cheeks and i wud get irritated,it is so painful:-(.No i wish i was a kid and get all the attention.Not that i dont now,am very well pampered by my husband,my parents,my inlaws but still the best attention i’ve got is only as a kid……i wish there was a rewind button in life..wat say???? 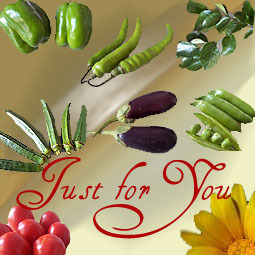 Thank you so much for putting up this Aur Curry recipe. I was really looking out for an authentic Aur Curry recipe. Will try it out tomorrow and give further comments. This kadhi looks great, Alka! I like that the besan rolls are simmered and cooked directly in the gravy. It’s so funny that i didn’t think beyond “Sindhis” – did not realize there were sub-castes too. If you do not like besan, you may use wheat flour to make “doklis”. Talking of “Chhaprus”, they speak different dialect which many “Sindhis” cannot understand and is different from normal Sindhi language or even kutchi/Gujrati language. They always form their own Residential society and always married in their “Chhapru” caste. Now recently they have changed. Many have learnt to speak normal Sindhi and also inter-caste (Sindhi) marriages take place. Good thing is that they fully understand Sindhi language but many find it difficult to understand their “Chhapru” language. Many use Chhapru as their surnames. Alka, wonderful curry and a wonderful read as always. Talk of Sindhis reminds me of my aunt’s neighbors who were sindhis. The aromas and smells wafting from their kitchen were alien but so new and tasty but different from the smells of kitchens I have knows so much so I was always visiting my aunt on one pretext or other. Alka,a very nice read..even i have same experiences..But the understanding and realising point of ours matter..I loved every scentence you have written here..
And this sindhi curry is new to me..But looks colorful and yummy..Wondeful click as always. I love khadi so much my hubby don’t like besan. Is there any alternative for that. you are a very good writer too. I love to have some moments as you mentioned .. Being Me,With Me,For Me. I feel once in a while you need to pamper yourself. Also most of us tend not to cook the dish which is not favored in the family but us and don’t bother to cook if its the other way round. The curry looks delish and easy to prepare. Lovely click.